"Volume Hear Here" was the name of the exhibition in the gallery where this work was installed, immediately before the exhibition which this work was a part of. 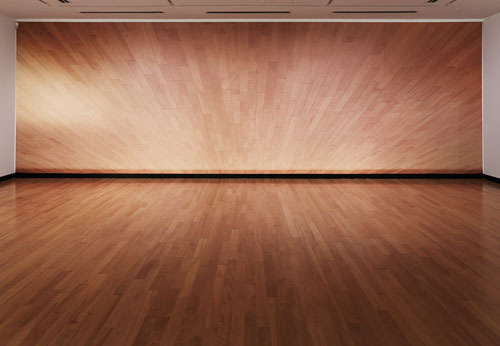 The photograph of the floor in perspective in front of the wall on which the work was installed was taken after the artwork in "Volume Hear Here" was removed from the gallery, but the lighting for that exhibition was still in place. For the "Volume Hear Here" exhibition, there had been a sculpture on the floor which had been lit by a spotlight above it, which is why a bright spot on the photographic mural is visible on the left side. The lighting for the exhibition which this work was a part of, "I Thought There Were Limits", curated by Julia Abraham, was then adjusted for the works in the current exhibtion and so the spotlight on the actual floor is no longer visible in this documentation of the work.